Need a dry place to put your chickens? 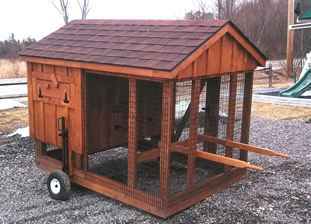 These chicken coops have everything you need to start raising your own chickens, ducks, or other birds! 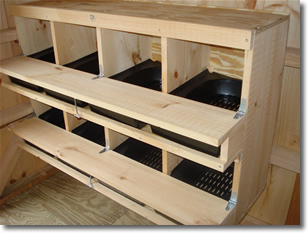 Egg gathering is quick and simple with the easy to clean, plastic nesting boxes. 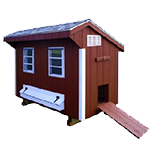 See the chicken coops that we have in stock here. Others can be ordered. 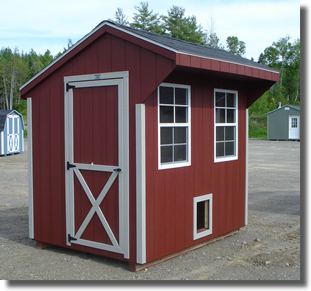 We have chicken coops that can be painted in a variety of colors and come in various sizes. 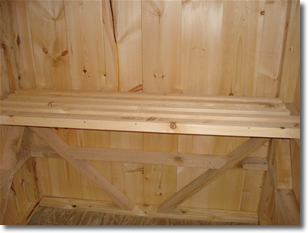 They are available in 3 main sizes as well as a 5'x7' mobile coop. The mobile version has built in wheels so you can move it around your yard. Moving this coop around allows your chickens to 'till' the soil, look for ticks, and get a constant supply of fresh food. The siding on these painted coops is SmartSide® which holds paint well and gives years of service. Currently there are 13 different paint color choices as well as 3 urethane colors.